sean douglas tran w i n t e r 2 0 1 4 | w e s t w o r l d A l b e r t A 15 AMA inspires you Disney The Insider's Guide to Practise your grin and pop on your mouse ears, kids, because we're doing Disney – and then some! First, we hula on down to Oahu, Hawaii, where a couple and their eight-year-old son find vacation perfection at Disney's Aulani resort (p. 16). en, a little something for the grown-ups: the best spots to get engaged at Walt Disney World (p. 24); plus, secrets for beating Disney World's heat and lineups (p. 28). 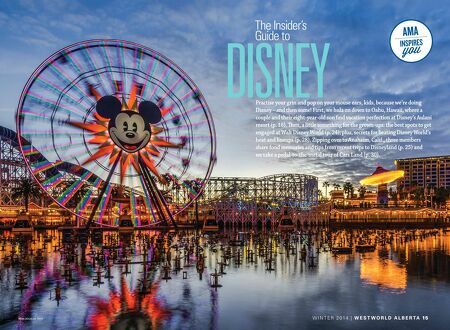 Zipping over to Anaheim, Calif., three members share fond memories and tips from recent trips to Disneyland (p. 25) and we take a pedal-to-the-metal tour of Cars Land (p. 30).